Born in Philadelphia, White began his education at Philadelphia College (which was later known as the University of Pennsylvania), taking his B.A. in 1765 and his A.M. about three years later. In 1770, he sailed for England on the ship Britannia, for his ordination as a deacon by Philip Yonge, Bishop of Norwich (but with the authorisation of Richard Terrick, Bishop of London), which took place in the Chapel Royal at St James's Palace on December 23, 1770. He subsequently returned to England on two occasions: once in 1772, to be ordained priest (again at the Chapel Royal, by Terrick on April 17), and again in 1787, when he was consecrated bishop on February 4 at Lambeth Palace Chapel by John Moore, Archbishop of Canterbury; William Markham, Archbishop of York; Charles Moss, Bishop of Bath and Wells; and John Hinchliffe, Bishop of Peterborough. In 1781, after further theological studies, he received a Doctor of Divinity degree from the University of Pennsylvania. William White was the second bishop consecrated for the Episcopal Church of the United States. 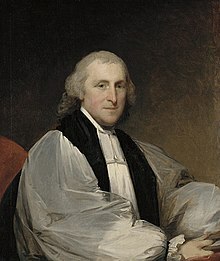 Rector of St. Peter's and of Christ Church for 57 years, White also served as Chaplain of the Continental Congress from 1777 to 1789, and subsequently as Chaplain of the Senate. In 1820, White joined prominent Philadelphia philanthropists who, in 1820, convinced the Pennsylvania legislature to fund the Pennsylvania Institution for the Deaf and Dumb, founded by rabbi David G. Seixas, now known as the Pennsylvania School for the Deaf. White served as the school's president for the next 16 years. He also ministered to Philadelphia's prisoners, becoming the first president of the Philadelphia Society for the Alleviation of Miseries of Public Prisons, which attracted the participation of numerous Quakers. Not known for his oratory (but for quiet sardonic wit), White earned Philadelphians' esteem for his erudition and ongoing charitable works, especially during the multiple outbreaks of yellow fever in that city throughout the 1790s. White and his friend and neighbor Benjamin Rush were among the few prominent citizens who remained to tend the ill when many other wealthy inhabitants fled to the countryside. As White aged, arranging for his successor became divisive in the diocese. Benjamin Allen arrived from Virginia to lead the diocese's most evangelical congregation, St. Paul's and also founded another congregation, St. Andrew's, without White's permission. White questioned certain aspects of lay leadership at the revival meetings. Allen and the evangelical party selected George Boyd to replace White's assistant James Abercrombie, and Allen in place of Kemper at the diocesan council. When they tried to elect Meade as White's coadjutor (assistant bishop with right of succession) over White's preferred candidate (Bird Wilson, a professor at General Theological Seminary but canonically resident in Pennsylvania), the diocesan convention ended in a deadlock. At the next Convention, Wilson took himself out of contention, as did Meade, and the divided delegates eventually selected Henry Onderdonk (of Brooklyn, New York; who preferred High Church practices but had also revitalized that congregation). White was a member of the American Philosophical Society, along with many other prominent Philadelphians, including Benjamin Franklin, as well as a trustee of the University of Pennsylvania from 1774 until his death. During his tenure as trustee, he also served as Treasurer (1775–1778) and President (1790–1791) of the Board of Trustees. White was married to Mary Harrison (1750–1797), who came from one of the First Families of Virginia. Mary's father, Henry Harrison, had also been the Mayor of Philadelphia from 1762-1763. The Whites had eight children, only three of whom survived to adulthood. As a widower, White supported seven of his grandchildren. In 1813, the bishop's widowed daughter Elizabeth brought her two daughters to live in the house. Elizabeth, called "Betsy" by the family, managed the household for nearly twenty years until her death in 1831. After the death of the Whites' son-in-law and daughter Mary, White and Betsy brought his five grandchildren (through Mary) into his home where they lived for the ten years leading up to his death. White's younger sister Mary was married to Robert Morris, who was known as the "Financier of the Revolution" for securing funding for the colonial cause. White's household included a free African American coachman, named John, but no slaves. ... [T]he duties of the several important relations in which he stood to society were performed with undeviating correctness and suavity; he possessed the rare merit of winning the respect and love of an entire community to which he was an ornament and a blessing. His piety was deep and unfeigned; his walking humble yet dignified; his acquirements profound; in his mind the welfare of the Christian church was always the prominent consideration ... He was one of those examples of steady virtue sent upon earth by Divine providence, as if to prove how near the great pattern of perfection it is permitted to approach. White died at his home after a lingering illness, retaining his full mental faculties until the end. He was buried in the family vault at Christ Church Burial Ground on July 20, 1836, next to his brother-in-law, Robert Morris. On December 23, 1870 his remains were re-interred in the chancel of Christ Church. His home at 309 Walnut Street in Philadelphia is today part of Independence National Historical Park. It is notable, in part, as one of the first houses to have an indoor "necessary," at a time when most privies were built outside of houses. The prominent physician Benjamin Rush lived next door. A second Bishop White House is located on Old Mill Lane, in the Historic District in Rose Valley, Pennsylvania. White sent his family to this house in 1793, during the Philadelphia yellow fever epidemic. Though his family lived there and he visited the house, White generally remained in Philadelphia. White is honored with a feast day on the liturgical calendar of the Episcopal Church (USA) on July 17. In regard to the subject of your inquiry, truth requires me to say that General Washington never received the communion in the churches of which I am the parochial minister. Mrs. Washington was an habitual communicant ... I have been written to by many on that point, and have been obliged to answer them as I now do you. ^ Barnes, C. Rankin, "The General Convention Offices and Officers 1785-1950"
^ Only William Stringer, a recent immigrant form Ireland in 1773, remained a Loyalist among the Anglican clerics in Philadelphia. In a Letter to Lord Dartmouth on March 6, 1778, from Philadelphia, Stringer reports that he is the only clergyman in Philadelphia who has acted consistent with his ordination oath of allegiance to the King and duty as a minister. See The Manuscripts of the Earl of Dartmouth, Volume 2, p. 460. ^ The American Philosophical Society (1837). "Obituary Notice (White's name appears at the top of the list)". Transactions of the American Philosophical Society. Philadelphia, Pennsylvania. V.—New Series. : ix. Wikimedia Commons has media related to William White (bishop). The Magdalen Society of Philadelphia Records, including records of the Society from its formation in 1800 until 1918, are available for research use at the Historical Society of Pennsylvania. Mark Antony De Wolfe Howe, Memoirs of the Life and Services of the Rt. Rev. Alonzo Potter, D.D., LL.D. (J. B. Lippincott Company, 1871), 284-285. Comments by Alonzo Potter, Bishop of Pennsylvania, about White on April 4, 1851.